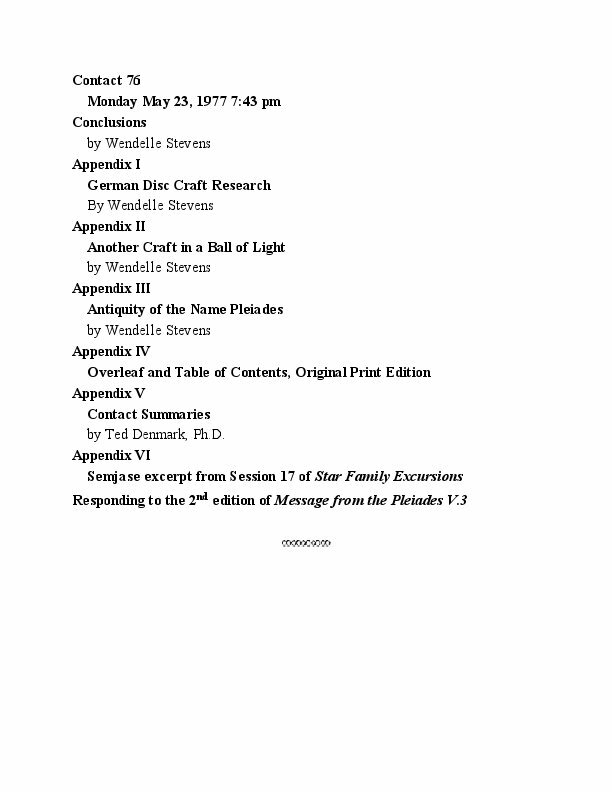 These are the contact notes of Swiss farmer Eduard "Billy" Meier in a newly edited 30th anniversary 2nd edition, completely revisioned and rewritten by editor Denmark with numerous color photos of the ET Pleiadian "beamships" taken by Meier substituted for the black and white originals. 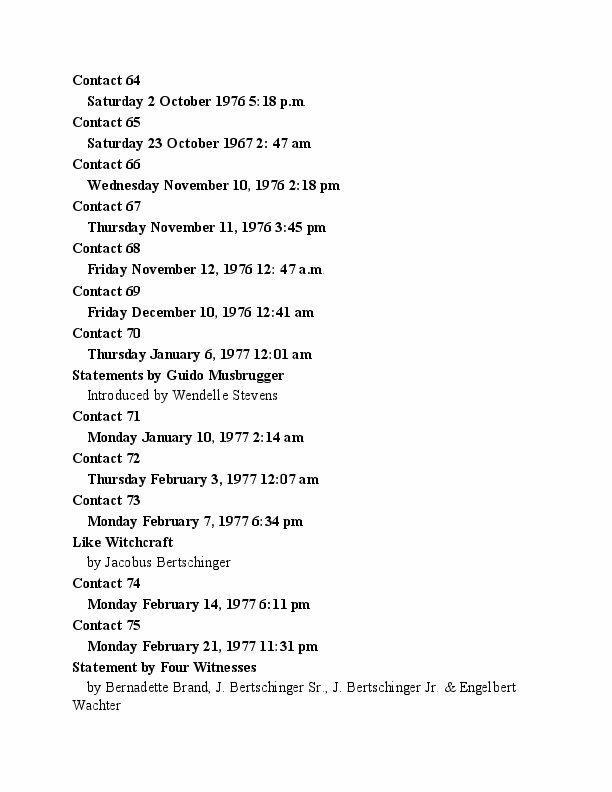 This is the first re-publication in English of the original classic Swiss German contact reports, out of print for more than 30 years with expanded introduction, appendices and notes. 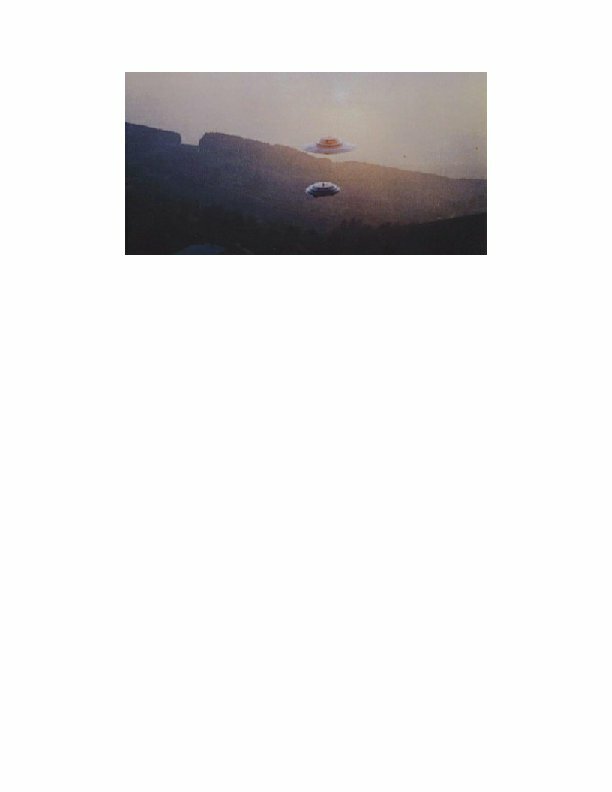 This underground classic is still likely the most important contactee document ever released for publication. 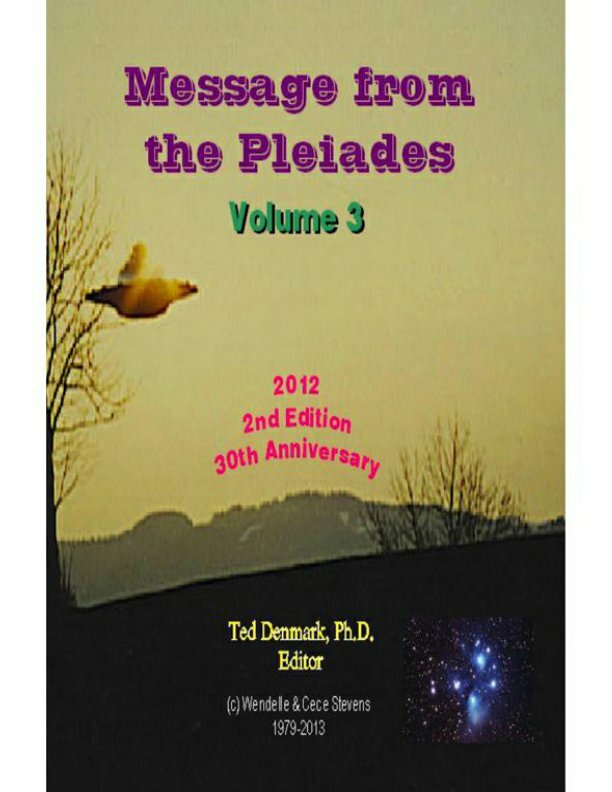 Message from the Pleiades, Volume 3, 2nd ed., Ted Denmark, Ph.D., editor, copyright Wendelle Stevens and Cece Stevens, Hemet, CA, 2013-2017 (original limited edition print book publication, copyright by Wendelle Stevens, Tucson, AZ, 1979). 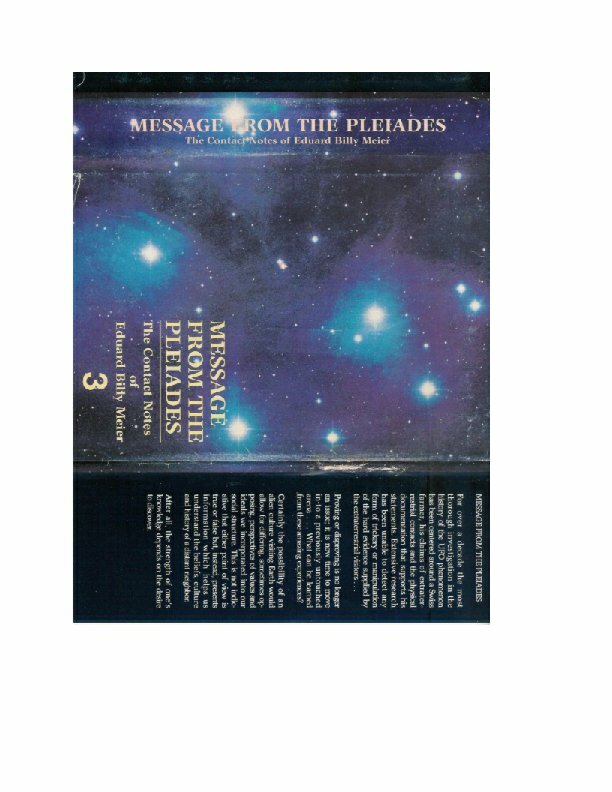 The ringing significance of many meaningful highlights and insights of this third volume of Message from the Pleiades could easily have been missed if one had read Wendelle Stevens’ original private English print edition, even several times, as happened for myself, first around the time of its initial publication in 1993 and beginning again more recently. The generic and viscous, comma-strewn “Germglais” of the original transliteration, as processed and finally published by Colonel Stevens, his associates and translators, particularly for this volume in the sequence, was just not up to the task of revealing the fascinating and intricate circumstances being described in these continuing adventures mostly of Semjase and Billy beginning in the summer of 1976—particularly when compared to the longer, more carefully groomed and buffed flagship effort given to Volume 1. Volume 3 appears to have been left mostly in the condition of the original transliteration done by an as yet unknown “young German college student,” and so was even more in need of resuscitation. When I asked Wendelle in 2009 if the identity of the author of the first English transliteration had ever been revealed, he looked circumspect and just said, “No.” I didn’t pursue the issue any further, and he didn’t offer any additional comment. In addition to the general lack of polish given the translated text of these contacts, we can also note that Volume 3 did not receive the attention given Volume 2, which was less again than that of Volume 1, and there also isn’t much in the way of end notes or commentaries following the contacts as provided so valuably by Wendelle for Volume 1 (though his short introductions to each individual contact remain clear and insightful). 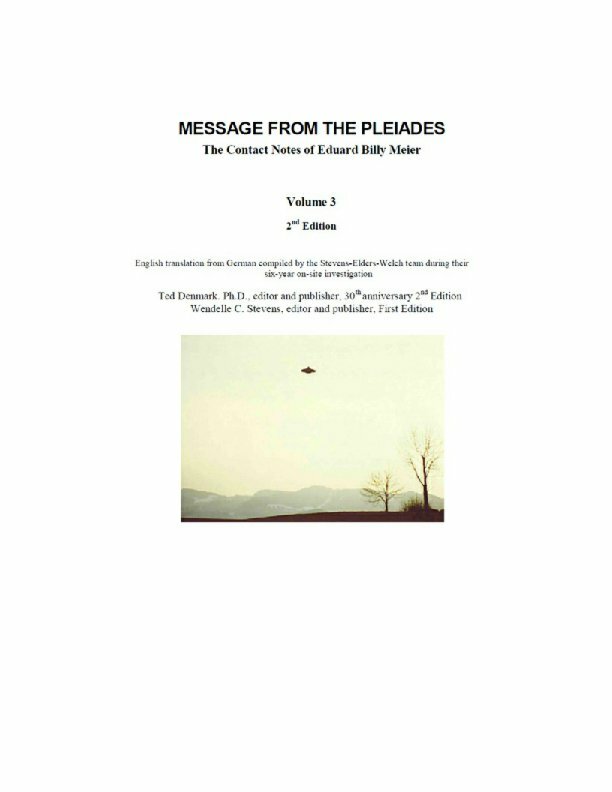 Volume 3 appeared more than 15 years after the events had transpired, and did not receive approval by Billy, even though Meier did not exercise public disapproval of Wendelle’s publications as he has done for the efforts of a number of his. i.e. Billy’s, other American project collaborators. 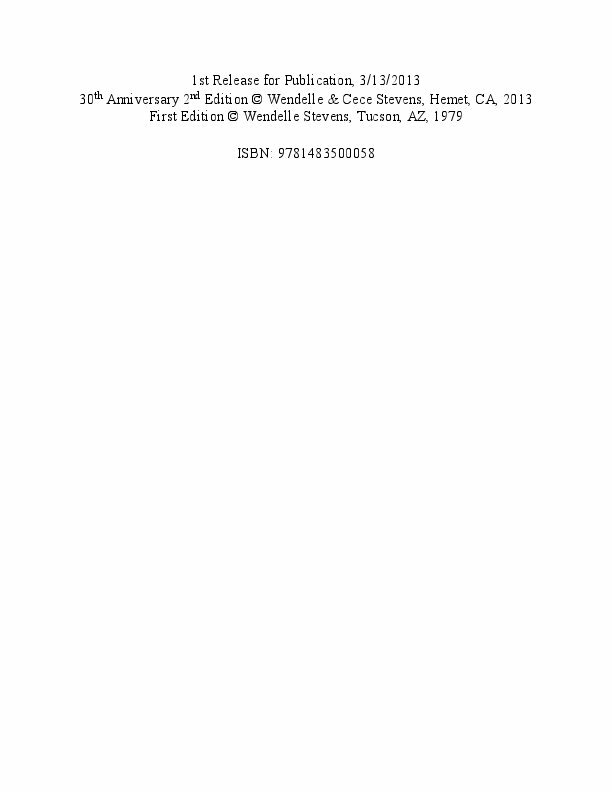 One emblem is that the V. 3 book doesn’t have its own distinctive opening photo, unlike the other volumes (he returns to Billy’s family portrait used for V. 1), opposite the page opening to Wendelle’s Preface, which was left as our only introduction—the same rather stark explanation—placed at the front of all four volumes. 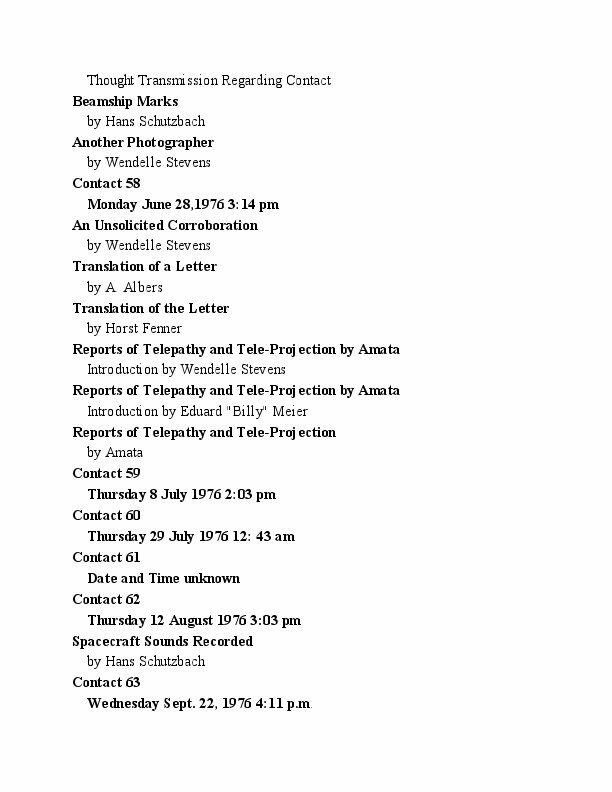 Another odd anomaly is that the break point between Volumes 2 and 3 set by publisher Stevens and/or his editor/ translator team, in which Contact 55 is both the last one of volume 2 and the first one of volume 3—even though they are different events on different days (Monday June 14, 1976 in V. 2 and Saturday June 19, 1976 for V. 3)—making the opening context of V. 3 very puzzling. Surely Wendelle must have noticed this peculiar duplication, but maybe he was just too busy to have proofed it or have it fixed in the effort to finally go to press, but we are not likely to ever publicly know the circumstances since Wendelle drew his final breath on September 6 of 2010 at age 87, sadly for all of us who knew him, had seen him give presentations, or admired the publications of this great pioneer of UFO studies who became its undisputed dean during his courageous, innovative and illustrious career. The situation in Contact 55 starting off V. 3 also deserves a high strangeness rating for other reasons as well; it is a telepathic “thought transmission” that starts with an oblique reference to a shocking revelation that had privately been made earlier by Semjase: namely, that there was a successful conspiracy in the Catholic College of Cardinals that resulted in the secret poisoning of the liberalizing Pope John Paul XXIII, who is called by Billy “Pill-Pauly” (for reasons not disclosed, but presumably having something to do with “pills”—was he a Valium Pope?). So things start out in white-water rapids, which surprisingly did not get censored out along the way (but must have resulted in some gnarly blowback from the Catholic establishment). But Wendelle, though prudent, was a man of great courage dedicated to the truth, even if he was not looking for overarching trouble, and he left this frightening and almost unbelievable story in the original publication, even recounting the incident in more detail at one of his UFO Congress presentations in Laughlin, NV, where he mentioned he had also become accustomed to receiving death threats, virtually on a daily basis. But somehow he managed most of the time to stay just under the radar of the most dangerous elements intent upon keeping such secrets hidden … and lived to a ripe old age, his death now bringing down the curtain on the classical era of 20th Century UFO research (though he admitted to me in private correspondence that he was a little disappointed that he had never made a direct sighting of a UFO himself). So, even though V. 3 might appear to be the “weak sister” of the four sibling volumes, it has turned out for me in the close quarters of re-editing, to be a diamond-in-the-rough, only awaiting a more penetrating and sympathetic rendering to reveal its extraordinary facets, which it is hoped will now be far more accessible, again for the first time to a new generation of English readers. There is no great central event here, like a hyper-space/time journey to the edge of the Universe as in V. 1, or fabled penetration thorough the Sargasso Sea portal into the parallel worlds of Planet Earth in V. 2, or indeed Semjase’s tragic slip in too quickly beaming herself up in V. 4, but it is nonetheless a most significant bridge between these initial adventures and the poignant accident that closes out the early series of contacts of Billy and Semjase, in her position as the lead liaison person representing the Pleiadians. These ETs are now usually referred to as “Plejarans” in the Meier special interest groups, but the two terms are likely suitably interchangeable since her planet Erra, about which she has now given much detailed information, was said by her to be located in orbit around its mother star Taygeta, the well-known star in the Pleiades, unless it is believed that this identification was part of the early subterfuge hiding their true origin in Plejara, said to be another 500 light years beyond the Pleiades, in earlier contact discussions. Various aspects of Earth culture and technology are compared and contrasted, as usual, with that of the Pleiadians as our V. 3 adventure begins, not the least of which is Semjase’s concern that in his ordinary earth life Billy must still travel by “explosion motor” air transit with all its attendant dangers. There are dangers of automobile and air travel in themselves, but also that from lurking nefarious characters and agents stalking the now notorious Swiss contactee and threatening his life at various twists and turns beyond the deranged lone assassins encountered earlier. Billy knows he is mostly going to be shielded from harm by his ET friends and protectors, so he tends to be a bit naively careless in the face of dangers looking to find him vulnerable, and so the story develops until Semjase’s father Ptaah feels moved to arrive on the scene to help shock him into understanding the nature of the bizarre dark forces that have recently been on his trail in several near-miss escapes. And as usual, Billy is full of his peculiar humor and endless questions about any situation that he or someone in his group wants to have answered. Semjase usually acquiesces generously and does her amazing brilliant extemporaneous best to respond to his and their need to understand obscure circumstances, as well as deliver several extraordinary chronicles of galactic as well as Earth history that she has prepared for Billy (and us!) to hear. Like Semjase’s matter-of-fact contention that our ancient common human ancestors who originally came from a planet in the Constellation Lyra, actually first developed space travel … 21 million years ago! It is surely a claim that would require extraordinary evidence to be in contention for creditability with our Earthuman shortened time line of historical knowledge jammed together into a few recent millennia, even though we know we are living on a planet set in orbit around a star that is very, very much older, really, than we can imagine. How much older our beautiful planet Earth and its mother star Sol are than our current scientific knowledge has concluded, is also provided for our shocked amusement: 646 billion years and 1 trillion, 730 billion years, respectively (!). One must recall that this is not presented as wildly sourced science fiction, but rather as accepted, well established, non-controversial … facts—to them—and offered to us in this first major well-documented, detailed contact with an advanced ET civilization of our time, as witnessed by a sophisticated participant observer (Wendelle) who visited the premises several times with a team of astute experienced investigative detectives while events were happening in the late Seventies. They discuss many subjects of both scientific and social or cultural interest: the number and timing of Earth’s Ice Ages, ethics of abortion and methods of birth control, dangers of overpopulation, the nature of various illnesses and much more. When Billy inquires what her actual “profession” is, she tells him in her inimitably modest way that it is common for people of her race to have the equivalent preparation for between 12 to 30 careers of the sort typically pursued in the life of an Earthuman. But, of course, she is also already half way to the goal of becoming a “Jshrsh” as we have seen revealed previously, usually rendered as “Goddess of Wisdom,” which we might alternatively call, Queen, Master or Goddess, but which would really extend to the notion of “superhuman” or my current favorite, “ultrahuman” in modern parlance. There are also numerous humorous incidents of an “all-too-human” nature, even for the ETs, apart from Billy’s own curious sense of humor, which he uses to help dispel his stressful awareness of being a somewhat disadvantaged “Earthworm,” unavoidably caught up in the exigencies of his own family life and financial troubles while trying to keep up with his new ET friends and collaborators. One such curiosity involves Semjase’s sister Pleja, who has become fascinated with stories (and probably through her own remote viewing!) of Billy’s means of travel by Mo-Ped motorcycle, to want to come to a contact with Semjase and Quetzal to meet him and ask if he can give her a driving lesson ... Semjase’s request to Billy for a way to be able to write in his Swiss-German language also comes to an amusing point for us now just over 30 years after the contacts occurred when Olga, a woman in Billy’s group, gifts her with a typewriter that Billy brings to a contact and dutifully instructs her in its use. Part of the humor, of course, is that now, 30 years later, the typewriter itself has become a relic unknown to younger generations on Earth since the rapid advance of personal computers (which were being rapidly developed during the mid-seventies!) has now gone into the era of smart mobile digital video phones. The first of Semjase’s extended historical chronicles of V. 3, in something of a more detailed update to that given by her in earlier volumes, covers the Great War between Atlantis and Mu nearly 13.000 years ago. It is an awesome spectacle in verbal reprise, not entirely unlike that depicted in the famous “Star Wars” movies of George Lucas, probably the most successful of legendary science fiction movies ever, which also happen to have been made and released during the mid to late 70’s (!). She then continues in this vein with a time line account of the greatest disasters in the last 12,000 years of Earth history, beginning with the Great “Biblical” Flood and continuing into more recent historical times, most notably with descriptions of disasters caused by the giant Destroyer Comet that has reappeared cyclically in our solar system every 575½ years. In addition Billy is made to realize that he had made major misinterpretations of her earlier explanations of the Destroyer’s orbital path because of the differing meanings for common terms used by them to categorize universes, galaxies, stars and planets. "I am not allowed to do so. Any acceptable decision would have to be by his judgment alone, because I myself, and the others, too, are in no way allowed to decide such questions. Every Earthuman must always make such decisions by himself alone, from his own power of decision making, independently of us. There must never be anything like this that is in any way dependent on us, which as well is a further reason why we make ourselves visible to only some few Earthumans, where this yet only happens then, too, after they have become aware of our existence. As little as you are ever allowed to show yourself as a master of teaching, so little are we allowed to show ourselves at all, for only in this manner of performance is it guaranteed that Earthumans will become self-supporting, able to think in their own way and to begin acting in a right manner to elaborate for themselves the true knowledge and liberty of inward understanding and outward awareness. But if we were to reveal ourselves publicly, and you were to appear as a great teacher, then the human beings on Earth would again fall into their erroneous beliefs and remain retarded in evolution. But in this way nothing would succeed, and Earthumans would not become free and autonomous. From that emerges the unique way in which only the basic framework of laws and covenants, with their explanations, are handed over to him, and he must then elaborate in his own intelligent language the correct approach to truth and knowledge. Any delivery of evidence besides that which we have given to you for evaluation, would be wrongly placed because when a life form is only convinced by so-called evidence about a particular matter, then it doesn’t hold any more value than as just another new belief. But knowledge, truth and wisdom cannot be elaborated by any such piece of evidence, but only by one’s own labor of thinking and inner reaching for clarity by an inwardly generated process for finding truth." 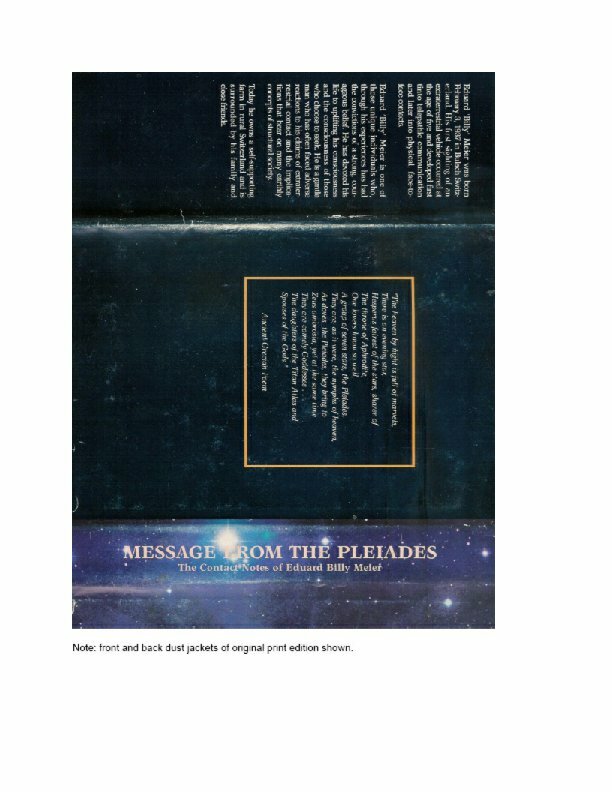 The Pleiadians have already given up on their anticipated plan for an early public disclosure of their presence by the year 2000—as early as mid-1976, a year and a half after the contacts have begun! 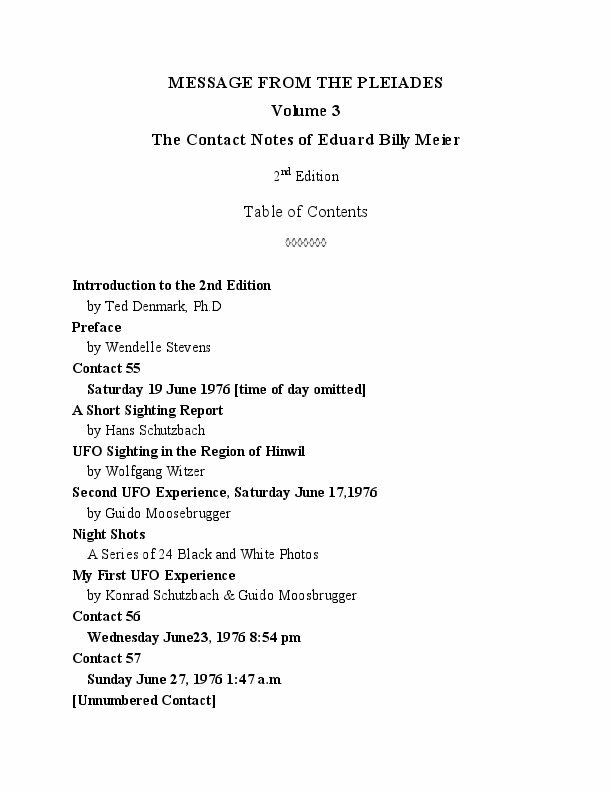 To which Billy, feeling somewhat relieved, responds, “Know that you have lifted a great weight of sadness from me with your explanations.” It is indeed a momentous conclusion and a major transition highlight in the Meier contact experience of Volume 3. Soon thereafter, Semjase, after perhaps feeling a bit overwhelmed herself with the direction taken by recent developments, brings her Jshwsh father Ptaah for the first time in V. 3 on a contact to help impress Billy with the need to overcome his stubbornness, get more rest and protect himself more vigilantly from dangers they have only recently detected. The outcome then appears successful as Billy admits his folly and makes jokes to help alleviate the humiliation he feels. The big event occurring towards the end of V. 3 is that Meier and company are going to be able to move onto a new property, a small farm that has recently become vacant in the nearby area of Hinterschmidruti. It is an exciting but also nerve-wracking prospect for Billy because his savings have already been exhausted since the contacts have begun, and he has also long since given up his part-time night watchman job. Nonetheless, Semjase confirms that the purchase will happen, and eventually, after additional edgy doubts … it does. Ted Denmark, currently residing in the California Motherlode, has lived in Northern California for most of the last 50 years. He attended Rice University for B.A. (Philosophy), studied Jungian Psychology in Zurich, Switzerland and attended graduate school at UC Berkeley where he received his Ph.D. in Developmental Psychology in 1975. He worked at UCB Space Sciences Lab as a design engineer for several decades before becoming a computer software engineer at Autodesk. He later taught computer science and design graphics at Columbia College in Columbia, CA as an adjunct instructor. His interests include organic gardening, solar architecture, astrology, ballroom dancing and a wide array of scientific and esoteric studies. His current retirement career as a writer has been primarily focused on exploring and writing about his and other contactee experiences over the course of his lifetime.